HO CHI MINH CITY, VIETNAM. 30 May 2016. 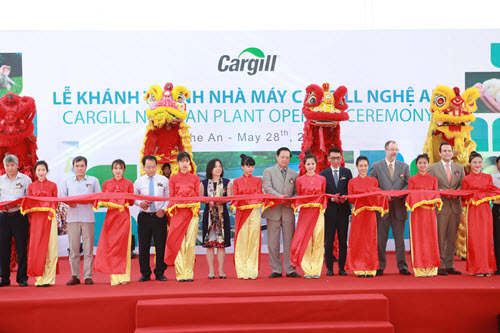 – Cargill has officially inaugurated a US$8.5 million animal nutrition plant in Nam Cam Industrial Zone, Dong Nam Economic Zone, Nghi Loc district, Nghe An province at an opening ceremony at the plant location on 28 May 2016. The event was attended by representatives of the Ministry of Planning and Investment (MPI), the Ministry of Agriculture and Rural Development (MARD), the Nghe An provincial authorities, the U.S. embassy in Vietnam, farmers from the North-Central provinces of Vietnam, and global leaders of the Cargill animal nutrition enterprise. This brings Cargill’s total number of animal feed mills in Vietnam to 11. The new facility will provide animal feed for livestock and will have a total capacity of 66,000 metric tons per year. It will incorporate Cargill’s uncompromising approach to feed safety, ingredient quality and product integrity. The company aims to provide customers with safe, trusted feed that maximizes the performance of their operations, which in turn helps to improve food safety across Vietnam’s supply chain. “Vietnam is one of our best performing markets in our animal nutrition business globally. This has been possible thanks to the hard work of our local Cargill team and by working very closely with the government, our customers and suppliers, the provincial authorities, and the farming communities around Vietnam. Our success in Vietnam is an invigorating story of how we are able to grow our business in a country, and at the same time contribute to the development of agricultural practices and improve the livelihoods of thousands of farmers,” said Sarena Lin, president of Cargill’s global feed and nutrition business. Cargill is on track with its investment strategy. The addition of a new production line in Dong Thap was completed during the first quarter of 2016 and construction of its twelfth animal feed mill in Binh Duong will be completed in the second half of 2017. The US$8 million expansion in Dong Thap increased production of specialty aquatic feed and enhanced Cargill’s aquaculture animal nutrition offering in the country. The US$30 million facility in Binh Duong will have a total capacity of 260,000 metric tons per year and will incorporate the latest technologies currently available in the industry. “In the face of a general slowdown in the Southeast Asia region, Vietnam’s economy continues to perform very well and foreign investments along with exports are on the rise. The agricultural sector is currently suffering from a terrible drought, but in the long run, we, at Cargill, see good growth potential in the industry. We will continue to invest in our animal nutrition business and the opening of our plant in Nghe An is testament of our commitment,” said Jorge Becerra, country representative and managing director of Cargill’s feed and nutrition business in Vietnam. Cargill is on track to meet its commitment to build 100 schools in Vietnam by 2020 across rural communities in Vietnam. As of May of 2016, the company has already opened 78 schools. Cargill provides food, agriculture, financial and industrial products and services to the world. Together with farmers, customers, governments and communities, we help people thrive by applying our insights and nearly 150 years of experience. We have 149,000 employees in 70 countries who are committed to feeding the world in a responsible way, reducing environmental impact and improving the communities where we live and work. For more information, visit Cargill.com and our News Center.